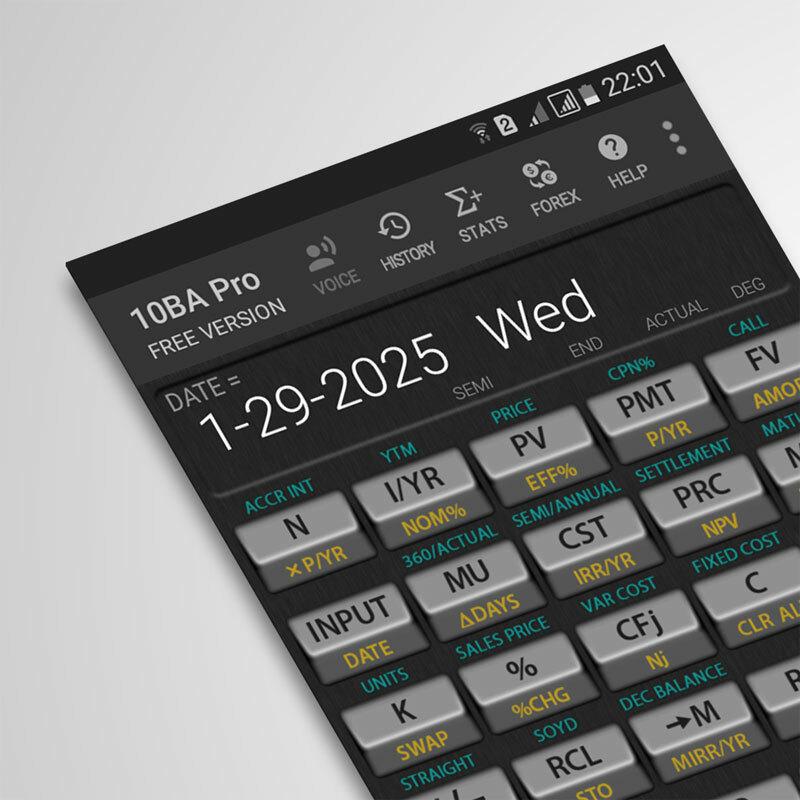 Many of the functions in the 10BA Professional Financial Calculator takes more then one number as input; for instance, the calendar function [ΔDYS] that calculates the number of days between two dates understandably takes two numbers as input: the first number as date1, and the second number as date2. Another common example is the percent change function [%CHG] that calculates the change in percentage between two numbers. Something like the percent of change from 10 to 15 is 50%. To calculate the percent of change from 1250 to 1600 the keystrokes are traditionally like below, which gives 28% as answer. In addition to doing it like the above, any two- or three-number function can also be calculated using the inline format without using [INPUT] as follows. To calculate the number of days between 29 January 2025 and 14 August 2025 (if using the month-day-year format they are January 29 2025 and August 14 2025) you can either use the traditional keystrokes using the [INPUT] key like below. and the keystrokes using the inline format without the [INPUT] key are like below. The answer is 197 days. (Note if you use the month-day-year format, the above dates are to be entered as 1.292025 and 8.142025). An advantage of using the inline format is input validation. In the above inline keystrokes, as soon as you tap [ΔDAYS] the calculator will check and make sure that the first number that you type is a valid date. If you incidentally type 29.292025 [ΔDAYS] the calculator will immediately display an error and not let you proceed. Compared this with the traditional keystrokes 29.292025 [INPUT] 14.2025 [ΔDAYS] where it initially accepts the two numbers without complaining and display the error message only after you tap [ΔDAYS] . This is because at first it does not know what you want to do with 29.292025 [INPUT] 14.2025. Only after you tap [ΔDAYS] it knows that you want to do a calendar function and it must check the validity of the two numbers. However, many people like the traditional keystrokes because they like using the [INPUT] key to clearly separate the numbers. So which keystrokes you want to use is a matter of preference. Now I want to know how soon my loan payoff sooner. Please show the mathod of inputing the data. Hi this is one way to do it. First, calculate the regular monthly payment (which you already did) using the keystrokes below. We get the monthly payment PMT = -1,238.47. Next, we need find the remaining loan balance after five years or after 60 payments. The result is FV = -164,629.07. (You can also use the built-in amortization schedule function [AMORT] to find the loan balance after 60 payments. Result will differ by a few cents due to the standard rounding mechanism used to generate the amortization schedule). Then there are extra payments of 25,000 per year. We need to calculate the monthly equivalent. We get PMT = -2,043.06. So basically with extra payments of 25,000 per year in addition to regular monthly payments of 1,238.47 you are making monthly payments of 2,043.06 + 1,238.47 = 3,281.53. Finally we need to calculate how long it will take to pay off the the remaining loan balance of 164,629.07 with monthy payments of 3,281.53. We get N = 55.33 months or 4 years + 8 months. Therefore with this payment scheme it will take 9 years + 8 months to pay off the loan. Note you will be making 4 extra payments of 25,000 per year, plus the last extra which is not fully 25,000. Please read the article “Determining Loans with Extra Annual Payments” in the link below. We are not affiliated with HP in any way. Hi, I am really enjoying this calculator, but I can’t seem to figure out how to run a calculation where the deposit frequency (e.g. monthly) is different from the compounding frequency (e.g. daily). I have P/YR = payments/yr, but I don’t see how to do C/YR. Can you please confirm how to do this? The [C/YR] function will be implemented in a future release of the calculator. In the current version you need to use interest rate conversion functions so interest rate matches the payment period. As an illustration, suppose you have an account that pays 6% interest rate compounded quarterly and you deposit $100 into the account every month. Find the future value after 10 years. The effective rate is 6.14%. Now find the equivalent nominal rate if payments are monthly. You will get the equivalent nominal rate of 5.97%. Now find the future value. The future value after 10 years is $16,361.50. Nice but I can’t use it! There is no Usor Manual to know how to use it. I have been trying for hours to find … but just can’t find, if thwere is one. I guess I’ll have to go with HP caculators they all have a User Manual. Each functions/keys in the calculator has a cheatsheet that describes what it does, and one or two examples. To view the cheatsheet tap the question mark icon at top right, then tap the function/key. For instance, to find out what [FV] is tap the question mark at top right, then tap [FV]. Since you are doing annual compounding, you need to set the number of payments per year variable [P/YR] to 1. Currently it is equal to 12 which is the default value. Here [P/YR] is the yellow function on the [PMT] key. So keystrokes are below. The future value is -110.25. For further info on [P/YR], simply tap the question mark at top right then tap [YELLOW SHIFT][P/YR], similarly with other functions/keys. Terrific app! Only disappointment is no RPN data input logic option. Is that something you would consider incorporating? I’m a career long HP12C user and RPN is the way my brain has become wired! Love your app though and may put the effort into rewiring. BTW, I will happily pay your $2 asking price. Yes, we do have plans to incorporate the RPN data entry option in a future release of the calculator. In the meantime, in case you are interested we have a simple RPN calculator available in the Google Play store from the link below. O idioma português não tem! Lamento que, no momento, ainda não tenhamos recursos para traduzir o produto para outros idiomas; no entanto, faremos todos os esforços para tornar isso possível e, uma vez que tenhamos os recursos necessários, o português será o primeiro idioma para o qual será traduzido. Obrigado. The current version of the calculator does not directly support 365/360 amortization. For this type of calculations you need to do interest rate conversion first as you might already knew. As of the RPN, yes we do have plans to incorporate this in a future release of the calculator. And in case you are interested, at present we have a simple RPN calculator with basic functionalities. You could check it out from the Google Play store at the link below.